Why is an assessment for cognitive impairment and dementia so important? It is because an early diagnosis means early access to support, information and medication. There is no single definitive test for diagnosing dementia. Assessment will account for behavioural, functional and psychosocial changes, together with radiological and laboratory tests. The assessment process may take three to six months to achieve. Assess cognition if you have any indication or suspicion of impairment in your patient. This is the first step in determining whether or not your patient needs further evaluation. DSM-5 definition and warning signs. It is important to take notes about the history of the patient from an "informant". An informant is someone who knows the patient well and has observed their cognition and function over time, for instance, a family member or close friend. The following cognitive assessment tests are the most commonly used; however, it is important to choose the tests most suitable for your patient and for the health setting within which you work. A reliable, valid and efficient instrument for general practitioners to screen for dementia in Australian primary care settings. The GPCOG involves two parts: a cognitive test for the patient and, if the result is uncertain, a short interview with an informant. The cognitive test takes less than four minutes to administer and includes the clock drawing test. Research indicates that it as effective as the MMSE in primary care settings. The GPCOG is free. This test is currently the most widely used cognitive assessment tool. It takes 10-15 minutes to administer. It is scored out of 30, with a score below 24 suggesting dementia. It is used to assess global cognitive status. It is recommended for use in Acute, Primary, Community and Residential Care. If used, the clock drawing test should be used as a supplementary test of frontal abilities. This is scored separately to MMSE. This test involves asking patients to draw a clock on a blank piece of paper with the time set at 10 minutes past 11, or a variety of other suggested timeframes. A variety of scoring systems exist, but the simplest way is to rate the numbers as well planned or spaced and whether the hands indicate the right time. It can be scored as either normal (correctly drawn) or abnormal (any other result). It evaluates organisation and planning. It is a useful screen for frontal functions of planning and conceptualisation. The Rowland Universal Dementia Awareness Scale is a short cognitive screening tool, recommended for use with those from culturally and linguistically diverse backgrounds. The only validated dementia assessment tool for older indigenous Australians. 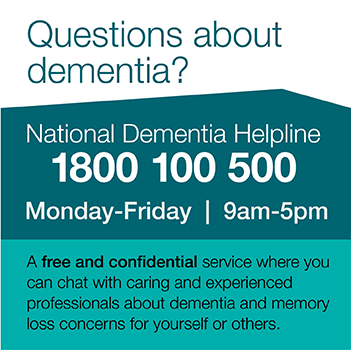 For more information, please visit the Dementia Outcomes Measurement Suite, a Commonwealth Government initiative to assist health professionals in assessing dementia in all settings. This website has assessment tools, manuals and scoring guides for download. For training and advice on how to 'build dementia practice in your practice', please go to this section on online training. These symptoms become more common as the dementia progresses and present a major cause of stress to carers. When BPSD occur, assess factors that may cause, aggravate or reduce the behaviour. Assessment should first exclude physical causes, such as delirium (common in patients with dementia), urinary tract infections or a drug interaction. Other factors, such as the environment and behaviours of others, should also be considered. For more information about BPSD assessment and clinical support services for your patients, please go to the dbmas website or phone their national 24-hour helpline on 1800 699 799. DBMAS provides 24-hour advice, assessment, education, intervention and specialised support to carers and care workers who provide support for people with dementia with moderate to severe behaviours of concern. TRACS Community of Inter-professional practice for people with Dementia - this site has been designed for professionals working with people with dementia who are looking to develop their knowledge base with regards managing the behavioural and psychological symptoms of dementia (BPSD).